Last night MTV held their movie awards, and I’m still not entirely sure when MTV decided they should have their own movie awards. They have been happening yearly for as long as I can remember, and have ridiculous categories like “best shirtless performance.” Hey Academy Awards, are you listening? There’s a new one to add to your ballot. This year, many of the nominees were actually nominees or winners of Oscars. Now, I know they must be dying for a giant statue of popcorn on next to their Oscar so MTV made sure to make this possible. More on that later though. Let’s talk about the fashions. When I awoke this morning I decided to check out what happened on the red carpet last night. I was fairly surprised only about 5 people apparently attended this awards show. Well, at least that’s all anyone is talking about. And when I went to the trusty MTV website, there was about a half of million people I’ve never even seen before or know their names. Am I getting old? From what I did see, I picked some of the best ones. Or at least the best ones in my opinion. 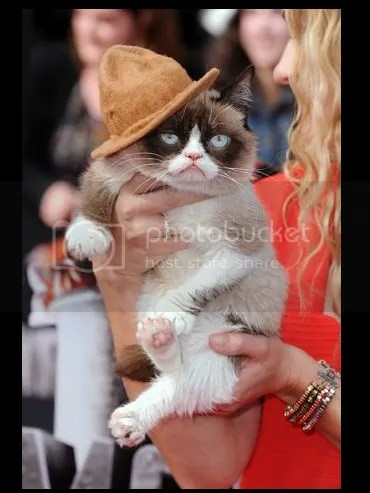 Grumpy Cat wearing a nice hat from the upcoming animal hat collection by Pharrell Williams. Probably…that is probably a thing. 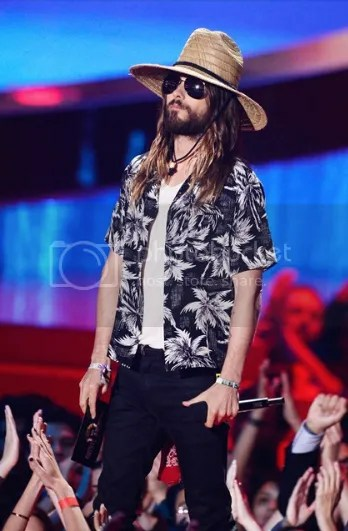 Did Jared Leto stumble into the awards thinking it was Coachella? Mila Kunis who won an award for best villain (Really?) wearing this nice little black dress. Desi Lydic (from Awkward) in this nice two piece ensemble. Loving those pants. Posted in Fashion and tagged Awards Show, Cute Animals, Entertainment, Recap, Red Carpet, Women's Apparel on April 14, 2014 by coffeeandwinter.